This week, I published a new book, “Journey of the Magi”! It is the year 2467, and a military coup has brought radical change to the Nakyrie Republic, which is now under the rule of Anatothryn Gant. Ambassador Aurelius DuKaine of Earth’s Concordium is deeply troubled at what the future holds for the galaxy. Meanwhile, within Nakyr’s secret police, Dyron Kyrshkandyr is on a hunt to uncover the identity of the Concordium’s most valuable Nakyrie agent, whose code name is Magi. As the Nakyrie Republic descends into dictatorship, events begin to spin out of control, and Aurelius DuKaine finds his life in ever-growing danger. Hundreds of light-years away, on the planet of Zahyr, Niles Kaden of the Dragonwine Police Department takes part in a drug bust that goes tragically wrong. But is everything what it seems? Fearing for his life, Niles Kaden leaves his homeworld and becomes a Drakewrath, charged with providing security for Drake Enterprises. But Niles Kaden’s first assignment as Drakewrath forces him to confront the very danger that forced him to flee Zahyr. The destinies of Aurelius DuKaine, Dyron Kyrshkandyr, Niles Kaden, and Magi become intertwined in this tale of intrigue and action as the story races towards its explosive conclusion. Will Aurelius DuKaine and his beloved wife escape the growing madness of Nakyr? Will the sadistic Dyron Kyrshkandyr succeed in capturing Magi? Will Niles Kaden bring a dangerous criminal to justice? And what connection does an assassination nearly 100 years earlier have to do with these desperate events? The man was burly, and had curly black hair. He looked all around him. “You are in heaven,” Jesus answered. Tony knelt down, bowed his head and crossed himself. Rising, he slowly walked towards Jesus. “What was the last thing you remembered, Tony?” Jesus asked. Tony was silent for a long minute, just staring at Jesus. At last, Tony kneeled down and crossed himself again. Here’s another excerpt from my novel, Day of Judgment, in which Maggie, an avowed atheist, receives a most unwelcome surprise. “Maggie,” Jesus said as the woman came forward. Maggie remained silent while her eyes blazed with anger. “You are wrong in that, too, Maggie. I definitely exist. See my hands?” Jesus now raised his hands, his nail-pierced wrists clearly visible. Two angels now came forward, and firmly grasped Maggie’s arms. As they took Maggie away, the last Jesus heard from her were the sobs of a woman who was only just beginning to realize the truth that she’d believed so many lies all her life, and who was only just beginning to realize the magnitude of her mistakes. Are you looking for a Christmas gift for your Kindle-reading loved ones? Consider purchasing “Day of Judgment” for them! She was crying, her hands hiding her face. Her voice was husky. “I know, Tanisha.” The words were true, yet spoken with a kind voice. Stunned, Tanisha lowered her hands, and stared at the One who sat on the throne before her. Then great, heaving sobs wracked her entire being. Others would have responded with sarcasm, derision, anger. Not Tanisha. She merely listened, and nodded her head. Tanisha was silent for several long moments. Then she asked, “What’s written in those books?” She hesitantly pointed her hand at two large books, both open before the throne. “No one does, Tanisha. But you always believed. And now, Tanisha, I have a surprise for you—“ Next to the throne, Tanisha could see a vague, indistinct figure. The figure approached, and slowly, Tanisha could make out her features. Welcome to my website! 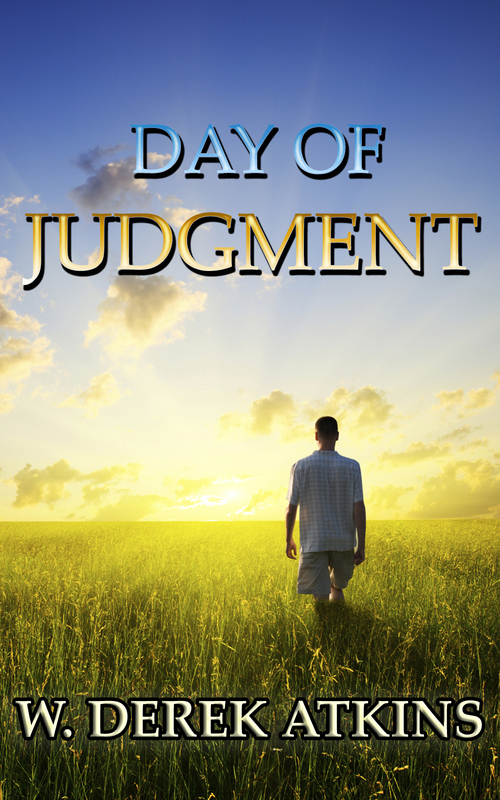 I enjoy writing stories, and I have published my first novel, Day of Judgment, which is an imaginative examination of what the Day of Judgment will be like, when all of us will stand before God and be judged by him. I plan to publish more books in the future, including at least one science fiction novel. Please visit this website for more information about Day of Judgment and other novels as they become available.